Purina Beta Adult Dog Food (Turkey and Lamb) is a tasty complete food for your dog that is full of protein and contains all the essential nutrients for maintaining good health. Containing a natural prebiotic called chicory, this delicious dog food actively works to help the digestive system and aid better overall health. Also, the wholesome duel sized kibble helps to prolong feeding time as the different sizes encourage more chewing, for better oral health. 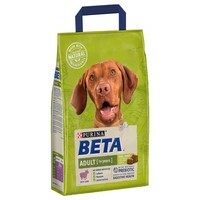 Tailored especially for adult dogs with average activity levels, this Purina Beta Adult Dog Food is a perfect meal that is sure to be a favourite with your dog! Turkey Meal (18%), Wheat*, Corn*, Rice * (9%), Lamb Meal (7%), Poultry Fat, Soya Meal, Wheat Middling, Dried Beet Pulp, Digest, Dried Chicory Root* (1%), Minerals, Dried Carrot*(0.07%), Dried Spinach* (0.07%), Dried Parsley* (0.07%).